I’ve been meaning to install Linux for a while, and decided to when I saw the book Ubuntu Unleashed in the 005 section of the library. 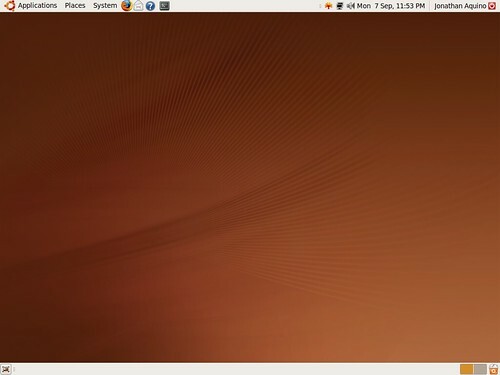 It had a CD with Ubuntu 7.04 (which I later found out is rather old), so I took it home and was pleasantly surprised to see that it “just worked” when I inserted it into my laptop. I decided to install it on my 5-year-old 2.4GHz Celeron with 512MB RAM. The hard drive was dead so I dusted off my scooter and went to Office Depot to pick up an 80GB one for $50. As expected, there were a few obstacles, but nothing that couldn’t be solved by Googling for error messages. I’m happy to say that I’ve got the Jaunty Jackalope version of Ubuntu finally up and running. Sticking with Gnome rather than KDE, which I haven’t tried. My primary computer is still a Windows laptop, but this Linux box will serve as a third monitor (via Synergy) and as a print server for the other computers on the network. I’ve signed up with SpiderOak to back up my data directory—they give 2GB for free. Installing Ubuntu has actually been pretty fun. And there are still a bunch of things I’d like to learn, which I’m looking forward to reading about in this big Ubuntu Unleashed book—which the Amazon reviews rate poorly, but it seems alright so far. posted by Jonathan at 9/08/2009 12:09:00 a.m.